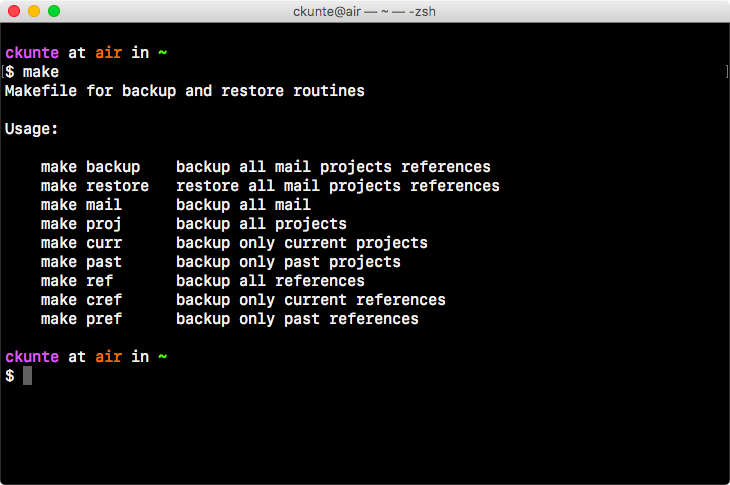 @echo "Makefile for backup and restore routines"
@echo "Backing up all email .."
@echo "Backing up current projects .."
@echo "Backing up past projects .."
@echo "Backing up current references .."
@echo "Backing up past references .."
Thanks for pushing this on the net. It has helped me making my own. @lil5: I've taken your suggestion to add the unlicense to this file. Thank you for your feedback, and happy to note that it is useful to you.